Hi! Smooth font really improved my minecraft experience a lot! 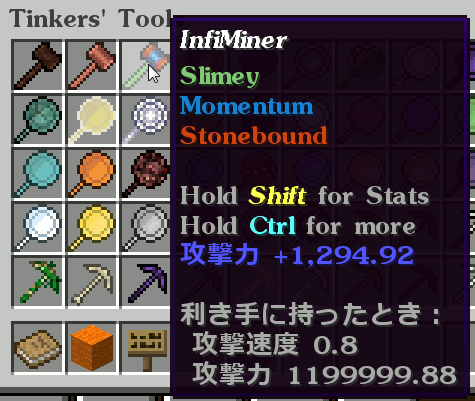 But I found minecraft still use a way to make text bold(I mean when using formatting code §l) which is far from pleasant (especially on CJK characters, it makes strokes unclear). 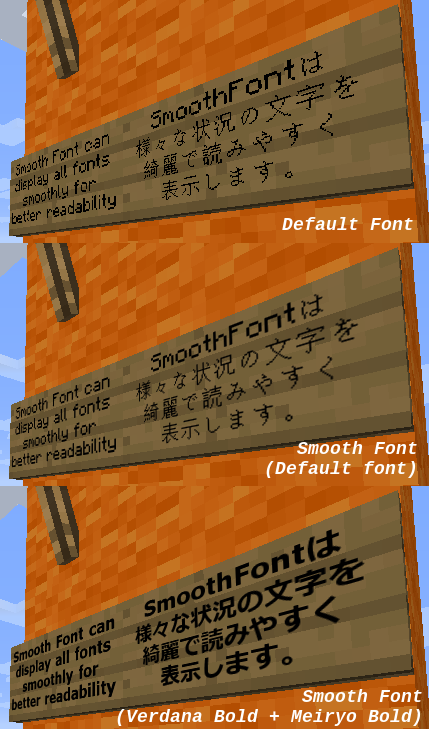 Many modern fonts have a special designed bold weight variant but minecraft just ignored them. 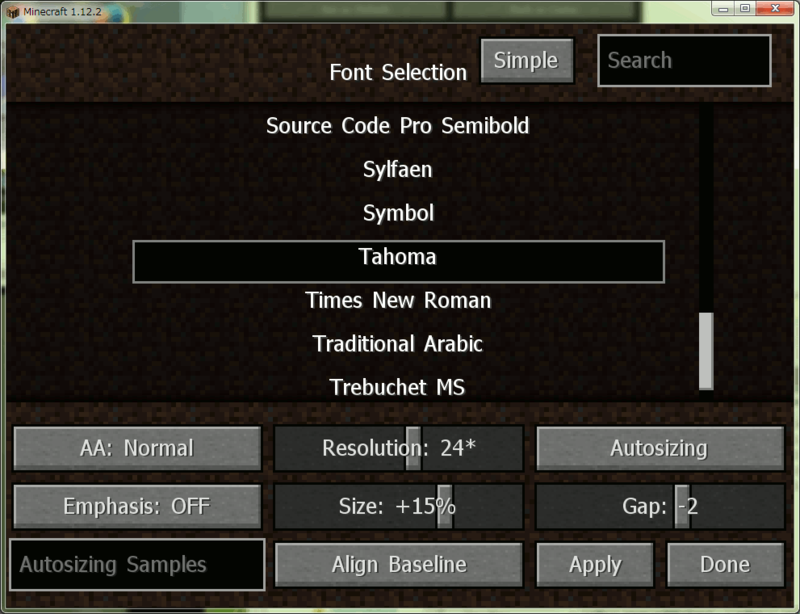 By the way I've noticed there is a setting to make font bold globally in your mod which looks pretty good. I want smooth font try find the bold variant of the chosen font automatically, and allow me manually set one. 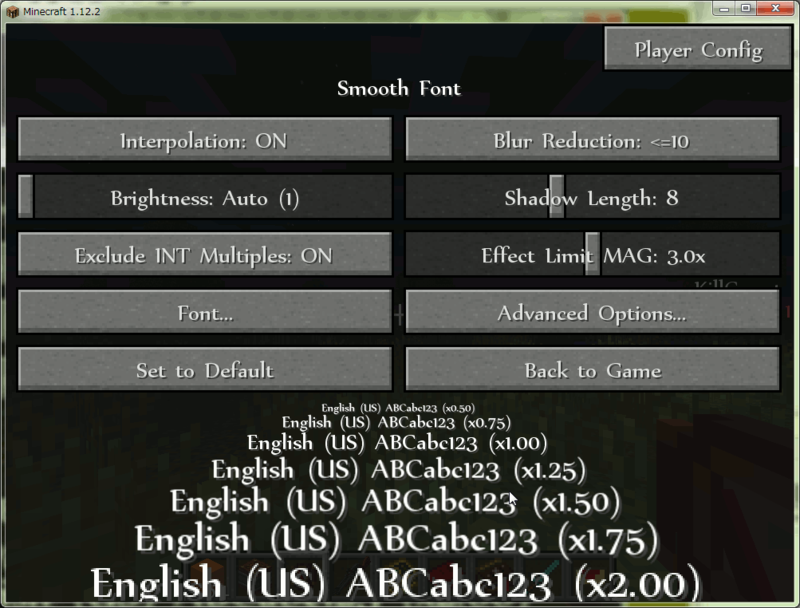 Finally, if there's no bold font being set, try to bold the font using smooth font's way instead of minecraft's way. Could you consider about this? You are right. 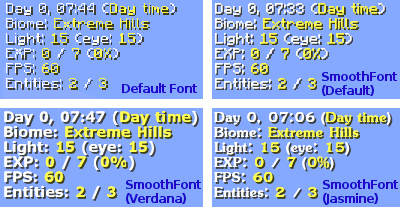 Vanilla Minecraft does not have dedicated bold fonts. Instead, it draws a normal font twice and make it bold. Smooth font draws bold fonts by using that process as it is. To realize this suggestion, I needs a lot of changes to the current code and also have to think about saving cpu/memory resources. So, I think it will take time to consider if it is feasible, but I will add the suggestion to my future consideration list. 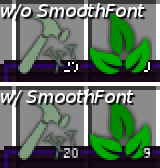 Hi there, got a crash, not entirely sure what's happening here but SmoothFont is the only thing crashing my pack so far. Any ideas? Unfortunatelly, there is no information that the crash is related to smoothfont. So, could you open an issue thread and provide the entire client log? Perhaps there may be some hints in it. Hello, May I help you translate this mod into Traditional Chinese? Thanks for being so considerate. Of course, translations are welcome! You can get original lang files by followings. 3. You can find lang files in assets\smoothfont\lang folder. there you go! :3 I will keep updating the translation, thank you for making this mod! If you are changing the font, you can enlarge the font size by adjusting a "Size" slide bar in a "Font Selection" GUI. 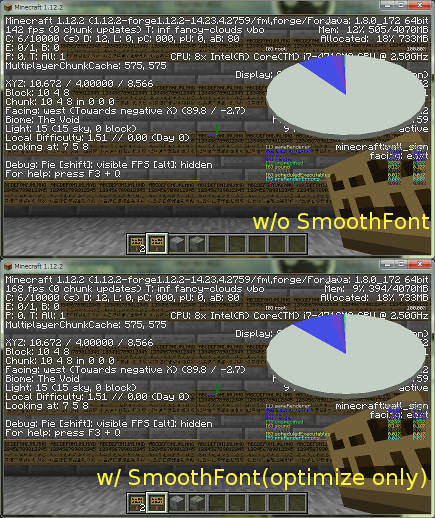 However if you are using the Minecraft standard fonts, the font size can not be changed for now. Personally, I like Arial and Arial bold which are beautiful fonts and easy to read. Hello, I found I have a long time didn't update my translation. Big thank for this mod! Hello! Thanks for updating again! I will replace it in the next release. Sorry, it is not available for 1.13-pre. Godlike mod. Biggest thanks!!! Especially for backports!! !